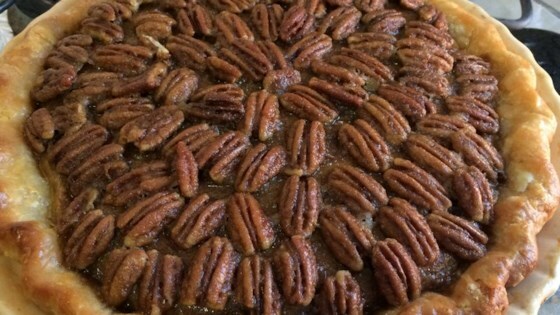 "A combination of the best pies: Pecan and Pumpkin!" Combine eggs, sugars, flour, spices and salt. Blend in pumpkin. Gradually add milk; mix well. Pour into 9-inch pie shell. Bake in 450 degree F (230 degrees C) oven 10 minutes. Reduce heat to 350 degrees F (175 degrees C) and bake 40 to 50 minutes longer. Sprinkle pecan mixture over pie the last 10 minutes before removing from the oven. To Make Topping: Combine 2 tablespoons butter, 1 tablespoon grated orange rind, 1/4 cup brown sugar and 3/4 cup whole pecans. This tasted delicious but it didn't look very nice. The pecan layer made it hard to cut through the pie. Might make again but chop the pecans. This recipe was a hit. The only complaint I have was there was too much pumpkin batter to fit into the Deep Dish pie crust. Other than that this pie was a hit and it tastes great!